Tamzyn and Michal by Louise Donovan. The quilt was planned after a telephone conversation with Sally when she advised on colour and explained that Tamzyn and Michal had met whilst working on the transport infrastructure for the London Olympics. Over the years I have made many wedding quilts, all of them with the aim of creating something personal that was relevant to the couple and their story. I used to use traditional patterns. From 2009, this approach started to change after a series of art courses undertaken at the St Ives School of Art. My work became more contemporary and abstract. Yet it was still about telling people’s stories – my working life as a teacher and psychotherapist shapes this way of working as does my social and political belief that people matter. Other influences from contemporary textile artists have also played their part, especially the works known as the Bosna Quilts which were created in a refugee camp in Austria by women escaping from the conflict. 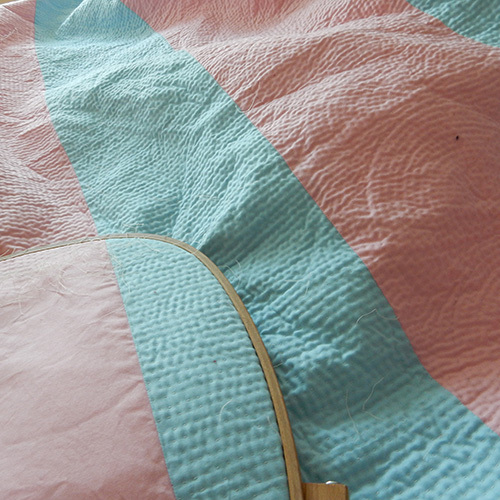 Tamzyn and Michal’s quilt is a mixture of contemporary and traditional. The pattern of the “bars” is used in both styles. 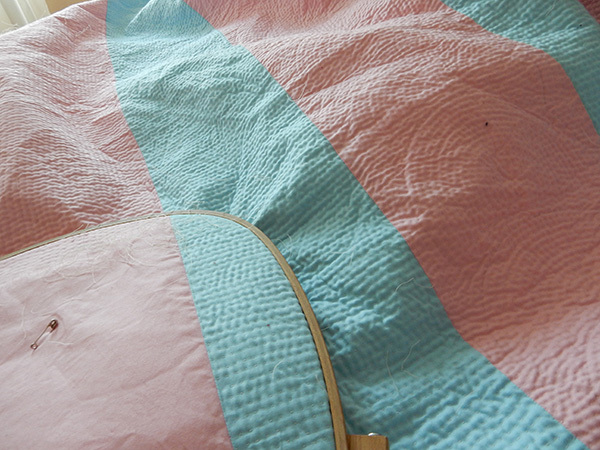 The overlapping circles in the central column are a traditional quilting pattern. 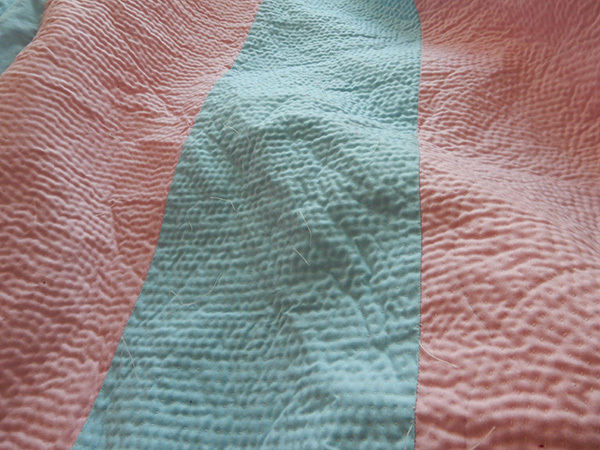 The quilting in the other columns represent traffic systems – the vertical lines in the pink symbolize roads and the horizontal lines in the blue rail tracks. Filling the border are overlapping circles – the Olympic circles.